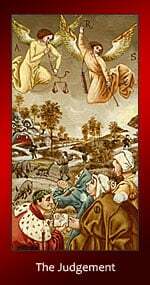 The Judgment card is a sign of rebirth in your life. The good news is that you’re going to have a second chance. This might mean redemption from any past wrongs that you feel you’ve done, or just a chance to reinvent yourself. The bad news is that this transformation can be uncomfortable as you follow a call that you’ve been ignoring for some time. Forgiveness of yourself and others is going to be a key part of this process. Is your relationship worth fighting for?